Rising high above you, Lenin Peak in southern Kyrgyzstan reaches more than 7000m altitude. Yet, when you push the shutter, you are already at 3300m. Let's be honest, there are seasons when reaching this location is easier. But I'm glad we went there! I simply love that place! 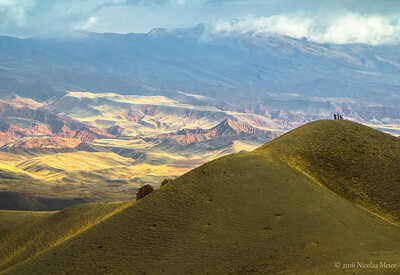 Located in the middle of nowhere in Central Kyrgyzstan, it's very empty of people, and very much packed up with beauty! 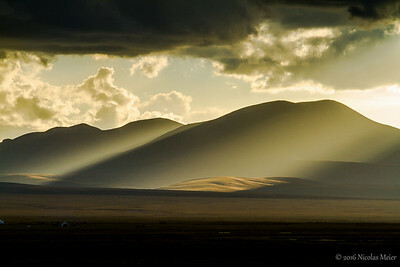 If Kyrgyzstan is an outstandingly beautiful country, it is mostly not a country of forests. So, in my opinion, trees are precious here, like those forests of Juniper trees growing high up to at least 3000m altitude. 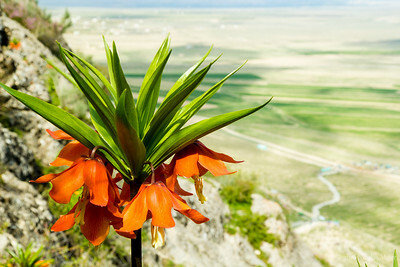 When it comes to the famous Aigul flower (south-west Kyrgyzstan), I find it hard to be sure what is fact, and what is legend. As usual in human history, when there is a special flower, a rock or a tree with a special shape, humans are quick to make up stories in their search for something greater than themselves. But what I've heard about the Aigul is that it takes 14 years for the first flower to appear. I could believe this. In any case, this flower needs protection, and is to be seen for maybe only two weeks in April. Better ask before traveling there! 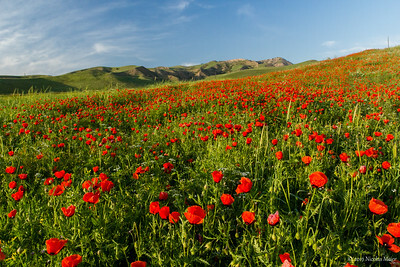 Spring time in Osh (south Kyrgyzstan). From further away or in close-up shots, Spring time is a beautiful gift. And one thing those photos don't allow to enjoy: perfumes, my friends! Perfumes! Almond, cherry trees, plums, apricot, apple trees... One after the other sharing their gifts of perfume. A tree blooming in the waves. To me, that's quite an unusual view! I was traveling with family members in this remote area of West Kyrgyzstan, an area well known for it's apricots. Kyrgyz handicraft is varied. 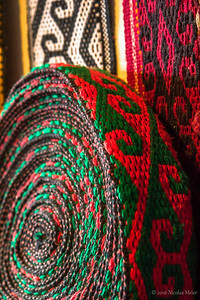 These ones are used to hold the different covers of a yurt, bringing colors inside. 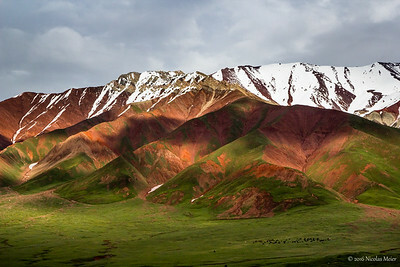 Kyrgyzstan is a country of many colors. From the mountains to those flowers. 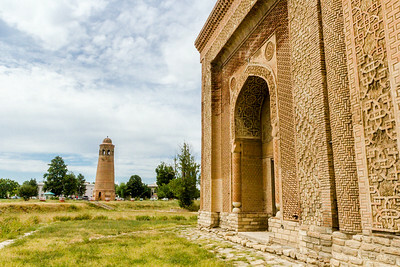 I took the picture not too far from the city of Osh, in the south of the country where I live. Kyrgyzstan is a land-locked country. But this doesn't mean it hasn't its own version of the ocean. Look at the waves! Here, people sail on a horse! This is maybe one of my favourite jailoo in Kyrgyzstan. 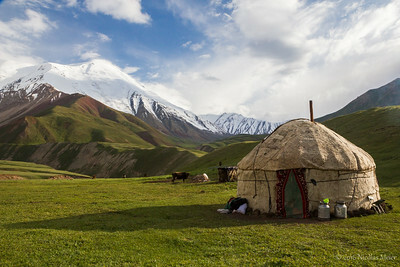 Many Kyrgyz people are semi-nomadic. 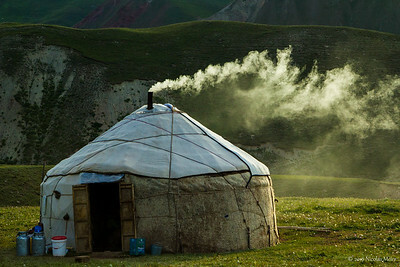 In Summer time, they move to the jailoo (mountain pastures), set up their yurt, and spend the warmer season there with horses, sheeps, cows or yacks. Truly, deep blue sounds more like the name you'd give to a picture taken by an ocean. Kyrgyzstan being a land-locked country - and a very mountainous at that! - you may wonder... 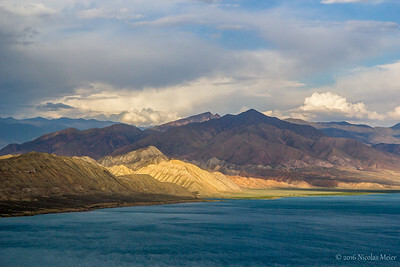 Yet, Toktogul lake in central Kyrgyzstan has a beautiful shades of blue. An evening in Song-Kyl, somewhere in the centre of Kyrgyzstan. For the people living in the many yurts like the one in the foreground, it's the view from their front door. 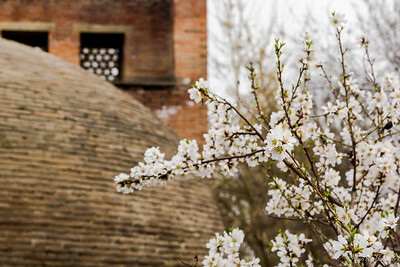 To the traveler's eyes, this looks just like another yurt and presents itself as one more good opportunity for photography. But for people living here, that's their home for Summer. For a traveler, this might look exotic, and it does, even to me after all these years. 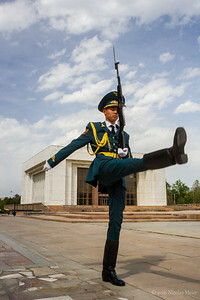 The culture of Kyrgyzstan keeps being fascinating! 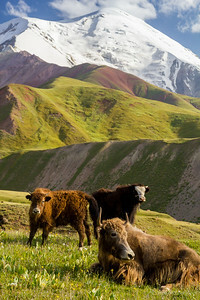 Kyrgyzstan is called the "Switzerland of Central Asia", or something like this. Well, Kyrgyzstan is so beautiful, and maybe we should call Switzerland the "Kyrgyzstan of Europe". 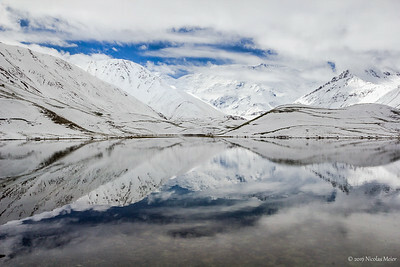 In any case, both countries are beautiful, and Kyrgyzstan doesn't lag behind when it comes to beauty! 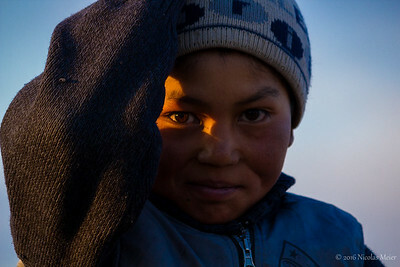 I think I took this portrait in Song-Kyl, a lake located at maybe 3000m in the center of Kyrgyzstan. Part of the face is in the dark. But as an illustration of hope entering darkness, the light manages to come through, and as usual, transforms everything it touches! 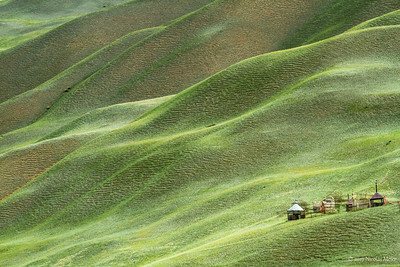 That child living on the kyrgyz Summer pasture is far, far from civilization. This place is quite remote, but worth the detour. Outstanding sceneries. And if you are lucky, you might even see horses ridding in the Far West type landscape. Smile, you are being filmed! The man had spotted me before crossing the river with his horse. 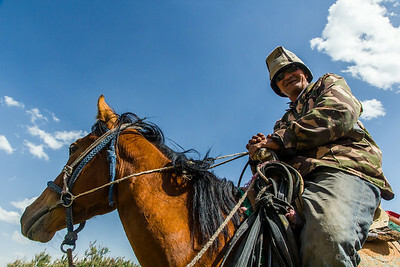 He is wearing the kalpak, a traditional kyrgyz hat traditionally made of felt. 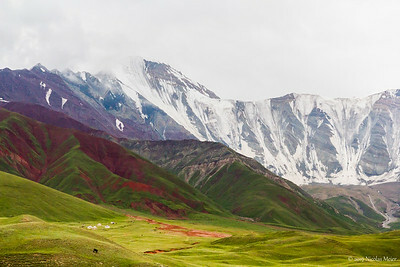 This area in the south of Kyrgyzstan is bounded by the Pamir mountains, with Lenin Peak reaching more than 7000m altitude. Beautiful location! Well, to be honest, the Swiss wasn't on the horse. It's maybe much better so. But there was definitely a Swiss making pictures on that day. 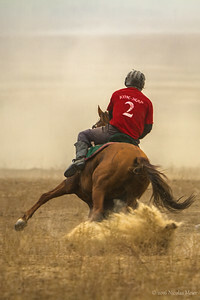 Lucky Swiss indeed, as they were quite some horse games going on that day in Kazarman (Central Kyrgyzstan). There are days when dust is beautiful! Like this day in this wild and beautiful area in central Kyrgyzstan, where a lucky photography lover was walking around while horse games were going on as part of an anniversary celebration in Kazarman (Naryn). Lucky me! 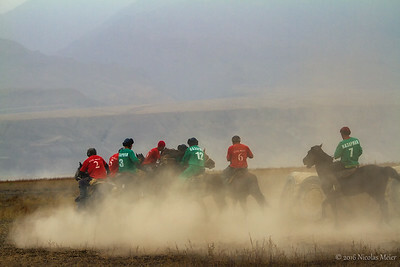 I arrived in Kazarman (Central Kyrgyzstan) the day they had a big celebration. 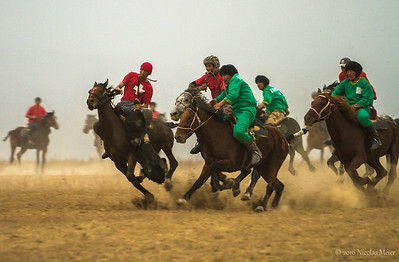 Horses play an important role in Kyrgyz culture, as do horse games. And on that day, they weren't many foreigners walking around with a camera. In fact, I believe I was the only one! 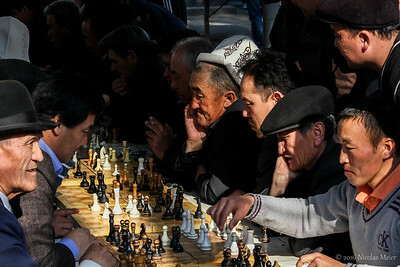 Capital of Kyrgyzstan, Bishkek is quite different from any other place in Kyrygyzstan. In that picture, that's the government house. 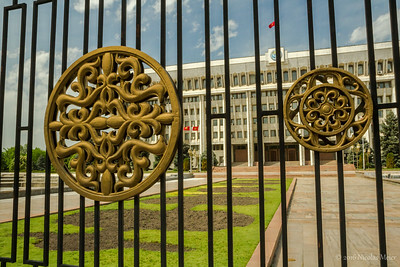 Bishkek has also many green places to offers, parcs interconnected together. Spring into beauty! 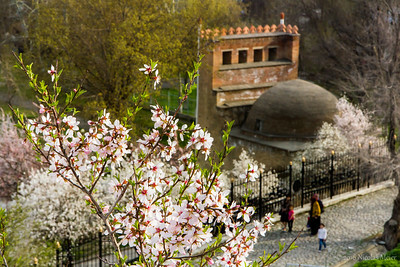 Come and enjoy Spring time in the city of Osh (Kyrgyzstan). Suleiman Too is a little mountain rising above town. In Spring time, trees are in bloom, sharing their fragrance with whomever is sensitive enough. 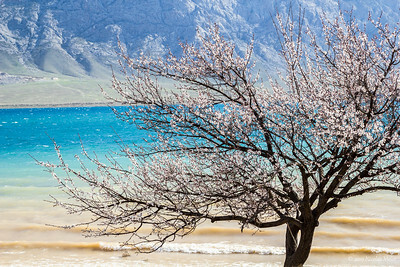 Spring time is yet another seasons worth visiting Kyrgyzstan. Of course, much of the mountains and passes are still covered in snow. But trees in bloom are to be seen all over the places. 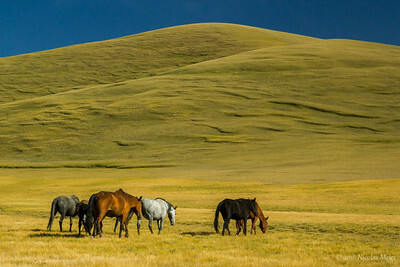 We could nearly imagine to be in Mongolia. But, hey no! 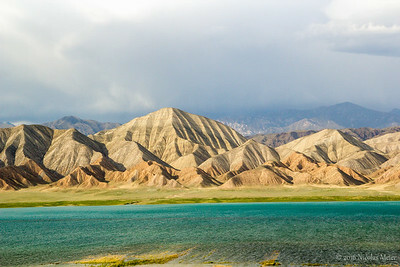 we are in the highlands of Kyryzstan (Song-Kyl lake) Kyrgyzstan offers a great variety of landscapes, from high and snowy peaks to mountain steppes, from lakes to semi-desert places. And it keeps changing as you explore this amazing country.